Expected by many (including us) to be a ho-hum also-ran after another miss on top free agents, the 2013-14 Dallas Mavericks instead more closely resembled the dangerous squads of years past. In a league where only one team hoists the O'Brien, the journey often matters as much as the destination, and last year's team allowed Mark Cuban's MFFLs to once again enjoy the ride ... even if it ended before the second round again. We'll never know whether Cuban was right to claim that Dallas was better off landing multiple pieces than one superstar, but the Mavs' moves did pan out. Despite their defensive warts, Jose Calderon and Monta Ellis made beautiful screen-game partners for a healthy Dirk Nowitzki, leading Dallas to top-five finishes in team field-goal, 3-point and free-throw percentage, as well as assist-to-turnover ratio and points scored per possession. The steamrolling O covered up for a permissive D, as Dallas won 49 games, survived the brutal Western gauntlet and returned to the playoffs. The reward for a race well run? An opening-round matchup with the San Antonio Spurs. Gee, thanks. Expected by many (including us) to be a brief, noncompetitive trip to the woodshed, the series was a surprise classic, with the great Rick Carlisle finding ways to throw San Antonio off-balance. Dallas squandered a double-digit lead late in Game 1 before dominating Game 2 and getting a buzzer-beating 3-point game-winner to take a 2-1 lead. The Spurs got level with their own late-game heroics, and after alternating tight victories sent the series the distance, San Antonio turned on the jets to win Game 7 and spark a title run. While getting eliminated by a longtime rival couldn't have felt good, it did suggest that the Mavericks' makeup — a high-powered offense revolving around Dirk with Carlisle at the controls — could still go toe-to-toe with the best. With a former hero back to anchor the defense and a new potential star swingman, Dallas aims to move beyond the frisky fringe and reclaim its former status as a heavyweight. Can this year's model threaten the West's elite? Or will a Mavs team dependent on a now-36-year-old Nowitzki get overwhelmed by the conference's sheer volume of quality competition? Healthy Dirk: still deadly. Monta on a good team! Buckets everywhere; stops are harder to find. Perhaps one kick away from changing history. Yes, thanks to a certain shaggy 7-footer re-upping at a well, well-below-market-rate. We knew Dirk was willing to take a pay cut to stay — he'd been saying so for months. But agreeing to go from making $22.7 million last season to making $25 million over the next three, and doing so after averaging nearly 22 points in just under 33 minutes per game, falling mere tenths of percentage points shy of another trip to the 50/40/90 club and finishing 10th in the NBA in Player Efficiency Rating? I mean, that kind of sacrifice makes other hometown-discount-takers look downright selfish. Dallas had already brought back center Tyson Chandler by the time Dirk agreed to terms, but Nowitzki's willingness to be a bargain allowed Cuban and general manager Donnie Nelson to continue big-game hunting in free agency, where they nabbed arguably the top small forward on the market not named LeBron James or Carmelo Anthony. After declining the fourth-year option on Chandler Parsons and allowing him to become a restricted free agent — a decision often rumored to have been an unofficial condition of their 2013 signing of All-Star center Dwight Howard, who shares an agent with Parsons — the Houston Rockets reportedly planned to land another superstar, go over the salary cap, and bring back Parsons using the collective bargaining agreement's "Larry Bird Exception." But while Houston (and everybody else) waited for LeBron to set the market into motion, Cuban inked Parsons to a three-year, $46 million offer sheet that gave Rockets general manager Daryl Morey just three days to make his play. Within the next 48 hours, LeBron was Sports Illustrated's most widely read columnist, and Chris Bosh and 'Melo were $100 million men, taking Houston's top targets off the board. Forced to choose between matching Dallas' onerous offer sheet or declining it to maintain flexibility, Morey chose the latter; the Mavs had their man, adding a 25-year-old playmaker and some heat to an already spicy feud. Their heavy lifting complete, Dallas loaded up on value plays. The Mavs brought back guard Devin Harris for about $4 million a year; landed Jameer Nelson, the Mavs' likely opening-night starter, for the room midlevel exception; traded for productive young big Greg Smith; and signed small forwards Al-Farouq Aminu and Richard Jefferson on minimum deals to replenish the wing after Vince Carter and Shawn Marion left. That's a starter, a sixth man, an intriguing backup for Nowitzki and Chandler, a rebounding wing who could become a perimeter stopper, and a veteran who just shot 40.9 percent from 3, all for less than $9.5 million this season — an amount Dirk's pay cut covers, with about $5.3 million left to spare. Dallas retained its top gun, got younger on the wing, and added pieces to both reduce Nowitzki's scoring burden and bolster its defense, all while staying clear of the luxury tax. Not bad. Chandler. The bearded one. No, the other one. Dallas was good-but-not-great on D (12th among 30 teams in points allowed per possession) in 2009-10. The next year, after adding Chandler to man the middle, they became near-elite (No. 7 in defensive efficiency) en route to winning the NBA championship. The Mavs have declined steadily on that end since he joined the New York Knicks in free agency, falling from eighth in '11-'12 to 20th in '12-'13 to 22nd last season, with bottom-five marks on field-goal percentage allowed inside the restricted area and on all other paint attempts. They've still been competitive enough to make the playoffs in two of those three seasons, because a healthy Dirk's enough of a monster to keep an offense afloat and because Carlisle's among the best at making a whole greater than the sum of its parts. But they haven't been a contender, because even with an elite offense — which Dallas didn't have in '11-'12 or '12-'13, but did have last year, finishing tied for second in the NBA in offensive efficiency and posting the league's best mark after the All-Star break — it's nearly impossible to contend without an above-average defense. If he can, he could give the Mavs the balance they need to battle the West's best. If he looks more like the gassed-out goliath of his latter days in Gotham, though, Dallas will be too one-sided to survive. Defense, if Chandler's not the man he used to be. Beyond that, it might not be "glaring," but I'm a bit concerned about how Nelson and Raymond Felton replace Calderon at the point. A full season from Harris, limited by toe surgery to 818 minutes over 40 regular-season games last year, should help. Nelson and Felton should also see their shooting numbers improve when playing alongside Nowitzki, whose shooting creates scores of wide-open looks for teammates, and both have been capable offensive caretakers in the past. But it remains to be seen whether their bounce-backs will equal Calderon's success as both a ball-mover and spot-up shooter. If they don't, a Mavs team already integrating a major new piece (Parsons) while adjusting to the loss of two veterans (Carter, Marion) who played nearly 12,000 combined minutes for Dallas over the past three years could struggle to develop chemistry despite an abundance of basketball IQ. With the defense already very much a work in progress, Dallas can ill-afford any offensive slippage. Parsons. After spending his first three pro years as arguably the league's best bargain, the second-round gem is being paid like a star. Now we'll learn whether he can produce like one, or whether his ex-teammates' rather cold assertions were accurate. "A lot of times, Rockets win, Rockets lose, it was all on James [Harden] and Dwight [Howard]," Parsons said during Dallas' media day session. "[...] I'm ready for that next step of my career. I'm ready to come here and have a bigger role, be more of a leader and that's why I came here." 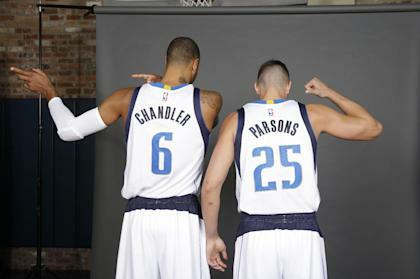 Parsons will cut, screen, drive, shoot, hand off, read the floor and find his teammates. His responsibilities will range wide and include, among a variety of other things, more traditional pick-and-roll play. Rarely, though, will Parsons be given the ball on the perimeter and asked to make something of nothing. Instead, he'll be set up to drive against a defense leaning one way or the other — the product of quick reversals and planned shifts in direction. Dallas finds so much of its excellence in this kind of choreography. There are options and alternatives at every juncture of every set, but the Mavs' base offense is rooted in just the kind of simultaneous action that allows a player like Parsons to attack at a place and moment of weakness. In time, Parsons will feed off of the gravity of his teammates, who will in turn benefit from his supplementary drives and pick-and-rolls. The conditions seem perfect for Parsons to show he's the All-Star-caliber wing he's looked like at times. Now comes the matter of proving it nightly. Honorable mention: third-year swingman Jae Crowder, whose shooting ticked up last season, who has become a decent defender and who performed well in reserve lineups (though not as well as certain statistics suggest). While Parsons will log most of the minutes at the three, Crowder could grab some of the minutes left behind by Marion and Carter and, if he can pair his defensive toughness with offensive improvement, perhaps carve out an increased role. Dirk stays healthy, acting as the sun around which Ellis, Parsons, Nelson, Harris, Felton and Dallas' other playmaking planets revolve and keeping the O up at the top of the league. Aided by Parsons, Crowder and Aminu on the wing, Chandler leads a charge that pushes Dallas near the top 10 in points allowed per possession. Carlisle masterfully manages his veterans' minutes, his rotation and his tactics, maximizing the deeper roster as the Mavs get back over the 50-win mark and into the second round of the playoffs. Dirk and Chandler get dinged up. An ailing Nowitzki forces both Ellis and Parsons to take on larger roles, with neither proving suited to be The Man. A defense that can't rely on Chandler struggles to both stop dribble penetration and limit its fallout. Carlisle cycles through a few dozen different lineups, but never finds the right mix to make it all sing. Dallas slumps offensively and stays in the defensive basement, barely finishes above .500 and misses the playoffs. 48-34, good for third in the Southwest and another postseason appearance as the West's No. 7 seed.